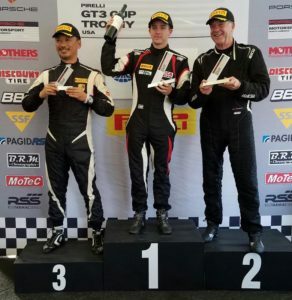 Sonoma, Calif. – When the Pirelli GT3 Cup Trophy USA returned to Sonoma Raceway on Saturday for Race 13 of the 2016 championship, the five-class field produced some clean and thrilling race action around the 2.5-mile road course nestled in scenic Northern California. The 35-minute event was slowed by just one full course caution as the race ran at a furious pace much of the way. Leading the charge was Robert Todd in the No. 52 BR Racing Porsche, but it wasn’t clear sailing for the California-based driver as he faced some tough competition from Flying Lizard Motorsports’ Mike Hedlund and Competition Motorsports’ Mark Nelson. It was Hedlund with the jump when the green flag flew, but when the field was slowed by a full course caution early in the going, the Flying Lizard driver got caught out on the restart. With Hedlund having lost some track position, the battle came down to Todd and Competition Motorsports’ Mark Nelson. In fact, Nelson began catching the No. 52 leading Porsche machine, but a quick off and back on in the final laps saw him running third with Michael Zuieback having inherited the second position. But when Zuieback spun in Turn 10, Nelson found himself back in the second position with the finishing order ultimately Todd, Nelson, and Hedlund at the checkered flag. Hedlund made a remarkable comeback to set the fastest lap of the race late in the going. In the Platinum category, John Trefethen delivered a promising run in his No. 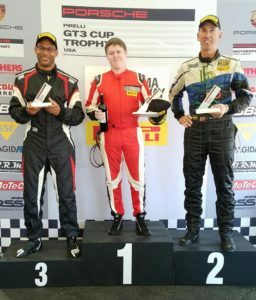 99 Porsche, leading most of the race, but when he ran into some slower traffic on the final lap, Alex Kirby took advantage and ultimately the race win. 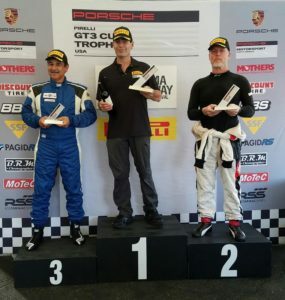 Larry Schnur started from the Platinum Masters class pole in his No. 32 FuelSafe Porsche prepared by TruSpeed Autosport and when the green flag flew, he never looked back. 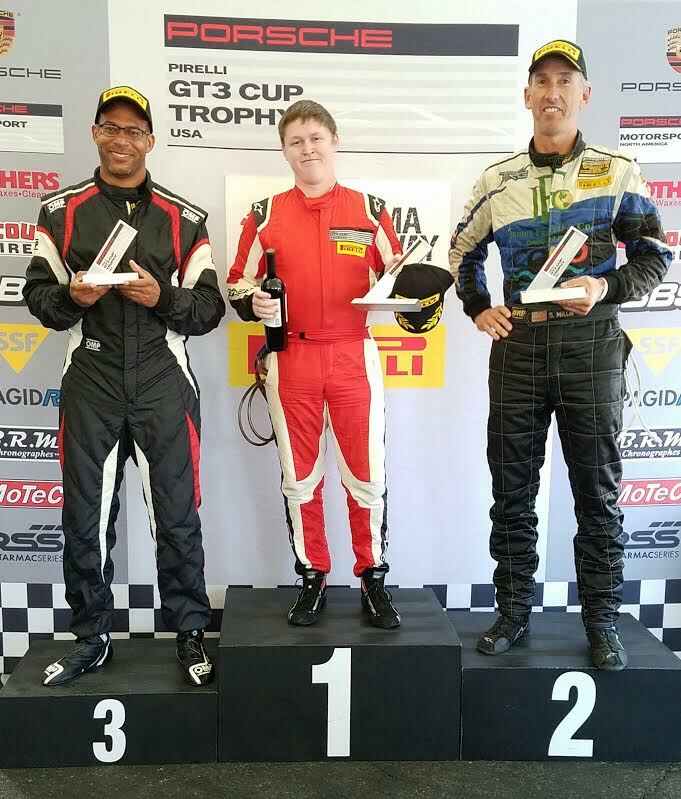 Pacing the Platinum Masters class throughout the race, he took the victory with a 13-second winning margin. 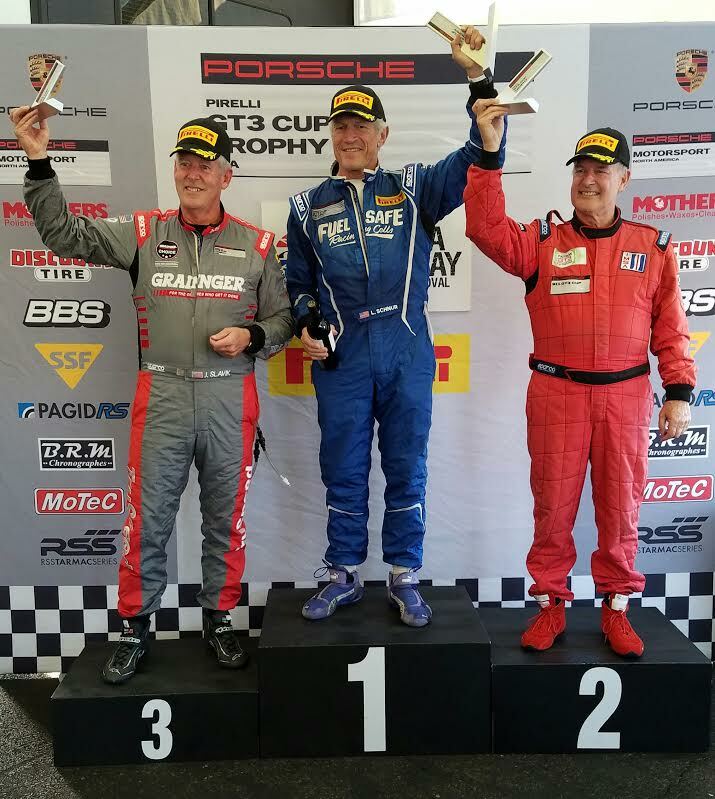 As the Silver class championship battle comes down to the wire between BR Racing’s Kevin Woods and Competition Motorsports’ Sean McAlister, it was McAlister in the No. 00 Porsche who emerged with the race win on Saturday. Starting on the outside of the first row, McAlister took advantage when the race went green and leapt into the first position. Extending the gap, he made it look easy as the second, third and fourth place cars of TRG’s Steve Miller, BR Racing’s Kevin Woods, and NOLA Motorsports’ Keith Jensen all battled among one another. It was nearly a photo finish at the checkered flag as Woods made a move on Miller in the final corner, but it was Miller who prevailed for second place as Woods took third. 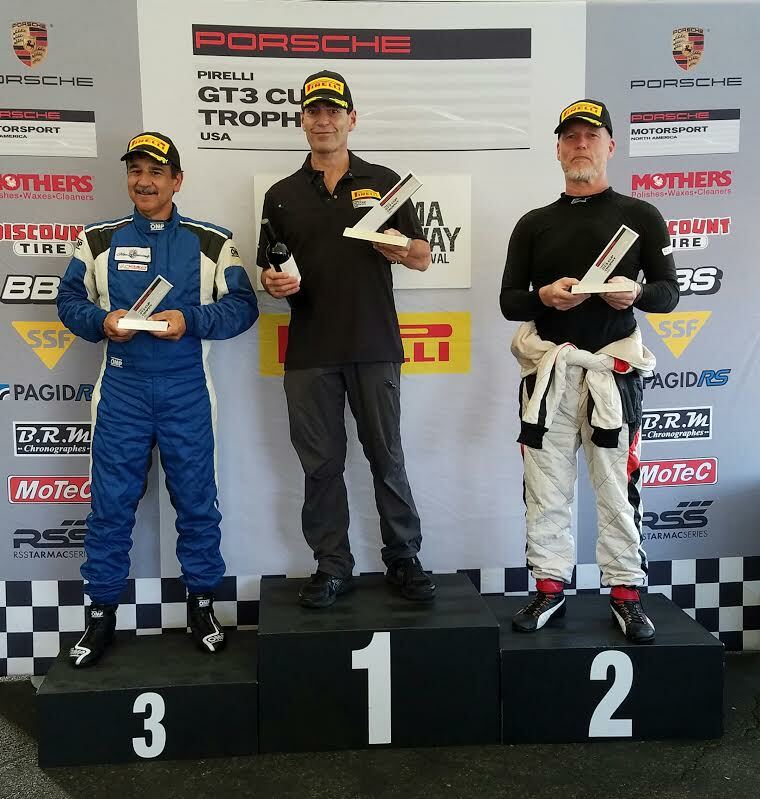 It was once again Steve Goldman who took home the Silver Masters class victory for Competition Motorsports in Race 13. 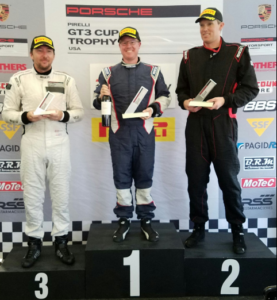 Flying Lizard’s Thomas Mayerhoffer and Competition Motorsports’ Chris Vivolo rounded out the Silver Masters class podium. 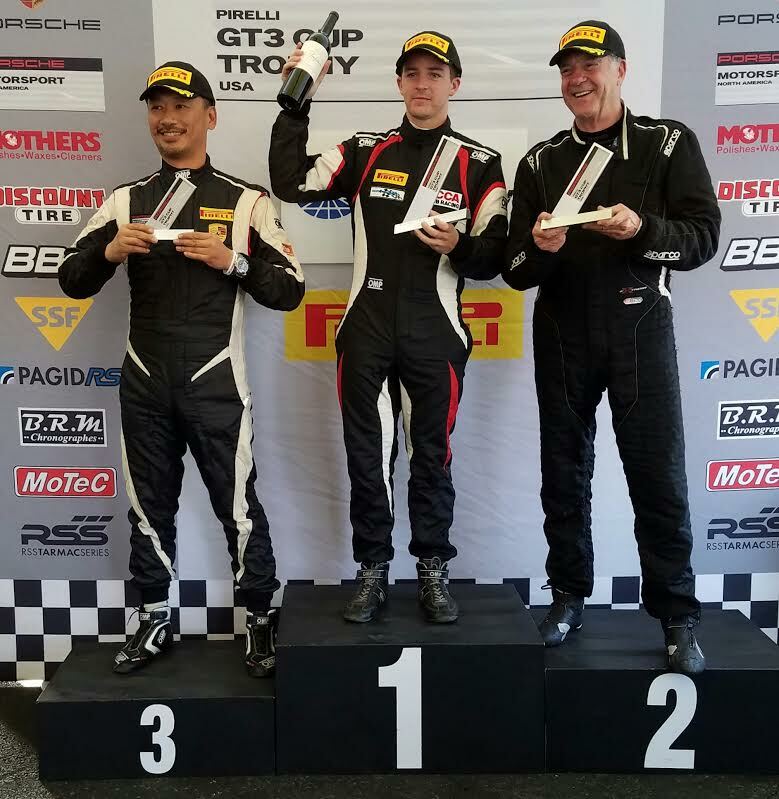 The Pirelli GT3 Cup Tropy USA series will return to Sonoma Raceway on Sunday for Race 14. The green flag is set to fly at 1:55 PM PST. This entry was posted in News on September 10, 2016 by admin.